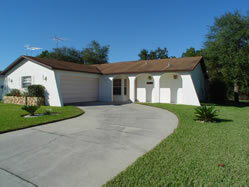 Close to Spring Hill, this 3 bedroom 2 bath villa with private pool lets you discover the real Florida. This three bedroomed, two bathroom pool home with solar heating gives you it all. Only 45 minutes to Tampa or go and see the Mermaids at Weeki Wachee or Manatees at Homosassa Springs.